Michael Broache, assistant professor of political science, started a chapter of Indivisible in Tampa in January, an national organization aiming to make the views of its members visible to elected officials, and to hold those elected officials accountable for the decisions they make. The organization was modeled off the Indivisible Guide–a document written by a group of former congressional staffers after the presidential election. It outlines ways for citizens to resist President Donald Trump’s policies. The Tampa chapter, although only loosely organized with no real memberships or meetings, has nearly 1,500 followers on Facebook. 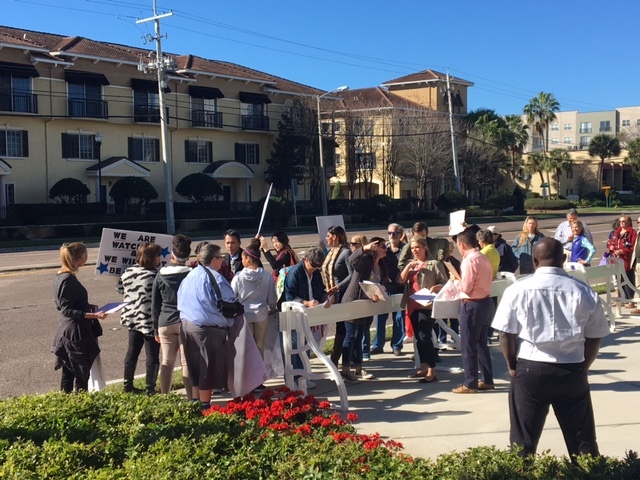 The chapter regularly gathers dozens of people at its weekly “Resist Trump Tuesdays” protests held on the corner of Kennedy and Dale Mabry. This is a new location for the group. They used to protest outside Senator Marco Rubio’s headquarters on Kennedy Boulevard near Westshore Plaza until Rubio was kicked out of that office because of the disruption the protests caused. Despite national headlines and news coverage of the ejection, getting Rubio evicted was never the group’s goal. The way Broache describes the goals of the organization, Rubio’s ejection was counterproductive. The point of the protests, Broache said, is to visibly demonstrate the group’s views. With Rubio’s lack of central location, that became much more difficult. “We hope that the senator is able to find new office space soon,” Broache said. The Indivisible movement is often reported in mainstream media as being the left’s equivalent to the far right tea party, which sprung up after Barack Obama’s election in 2008. Like the article by Politico published Feb. 10, talks about conservative’s accusations that “liberal mega-donors [are] bankrolling” the movement. Casey Bauer, a junior majoring in government and world affairs and interim vice president of the College Democrats, thinks these accusations are unwarranted. The Indivisible movement is somewhat counterfactual, Broache said. Though it’s impossible to know what would happen if Donald Trump had not won the election, it’s very possible the Indivisible Guide would never have been published and the movement wouldn’t have been created. This, Broache said, is in large part because people were so shocked by Trump’s win, even though he doesn’t think they should have been. That means that 3 out of every 10 simulations run for the polls, Trump won, Broache said. “That’s the equivalent of a .300 hitter. They’re going to come up to the plate and get a hit 3 out of 10 times… and so I don’t think it should have been as unexpected as it was,” Broache said. Whatever the odds, Trump did win the presidency and was sworn in on Jan. 20 as the United States’ 45th president, albeit not without a hefty dose of controversy. With ongoing investigations into Russia’s involvement in the election, including possible collusion from members of Trump’s team, and Hillary Clinton receiving a plurality of votes, many people are arguing that Trump’s win is illegitimate. According to a March 2017 survey, the number of people holding this view is greatest among young adults, with 57 percent of that group saying they viewed Trump’s presidency as illegitimate. Not all young democrats agree, though. The bigger issue, he said, is that it’s difficult to work with Trump because he’s so unpredictable. Although the ultra-conservative Tea Party is often seen as provoking further political polarization, having a liberal counterpart may do more to bring the country back to the middle. This is according to Bill Myers, assistant professor of political science. Myers said that if there are two people with polar opposite opinions on an issue, and they have to come to a decision. If the person on the left is willing to compromise, but the person on the right isn’t, the issue will undoubtedly be settled somewhere more to the right. Then, if the issue comes up again and nothing else has changed, the decision will continue to be pushed further and further right. Nate Gardner can be reached at nathan.gardner@spartans.ut.edu.